A hand blender is an essential appliance in your kitchen. Manually mixing liquids or whisking eggs is difficult and time-consuming. There are also lots of stuff that you can only mix with a blender, which is why you need to have the best hand blender. With this handy tool, you basically just need to press a button, and the blade on the blender arm will do all the work for you. You can find top-quality hand blenders from myriads of brands. 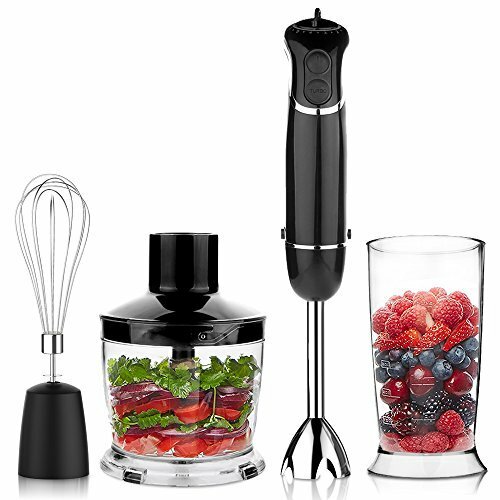 Some are simply blenders with a whisk attachment while others may include other things like a processor. Hand blenders are usually not expensive, but you need to buy a quality one if you want it to last long. The main thing to watch out for is the motor. Keep in mind that the higher the wattage, the more speed and power it will have. Also, the design has to be ergonomic since you need to hold it in your hand firmly. Here are three hand blenders from some of the best kitchen appliance manufacturers. Let’s see what their features are and how it can help you with your blending needs. The Mueller Multi-Purpose Ultra-Stick Hand Blender is a beautiful and efficient hand blender complete with a stainless steel finish. The hand blender features a 500-Watt, brushed copper motor that is quite powerful for a hand blender. It can be used continuously without any heating problems. This blender is made up of a removable blending arm with a fixed blade that is attached to the upper part, which carries the motor. The motor is quite powerful, giving you the kind of performance you need. You will be able to blend your liquids in just 30 seconds. This blender boasts nine speed settings that can blend almost anything for you. As for cleaning, all you have to do is rinse it, and it will be ready for the next use. It comes from a well-known European company Mueller, which guarantees premium quality. The company gives a two-year warranty for this particular model. It is super lightweight and compact, just how a hand blender should be. Its weight is only 2.1 pounds, along with a compact design that would not take much space on your kitchen counter. The blade on this hand blender is stainless steel, S-shaped blade. Included with it is a whisk attachment for easy whisking. 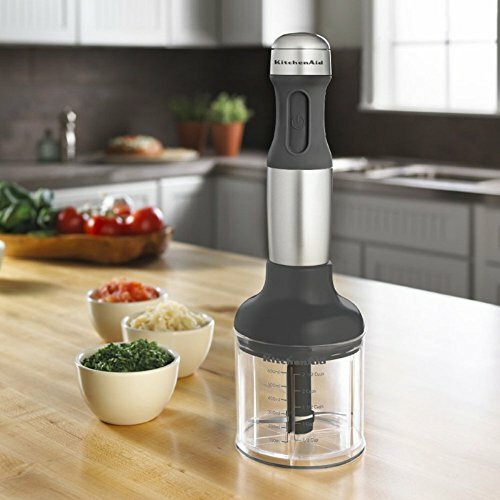 The KitchenAid KHB2351CU Hand Blender has three speeds designed to meet different blending needs. From eggs to smoothies to yogurt, you can blend anything easily with its eight-inch fixed blade. The blade arm easily fixes with the motor body, providing easy storage and operation. It is a complete solution for hand blending as it features a whisk and other useful accessories. You get a chopper attachment and a blending jar. The former (two and a half cup) can be used to quickly chop garlic, nuts, herbs, and even meat. The latter (three cups) is designed for blending liquids and storing them. Both of these accessories are BPA-free. It also comes with a handy storage bag. The wattage of the motor in this hand blender is 85 Watts. On the other hand, the handle offers a smooth and comfortable grip that makes blending quick and easy. The long, five-foot cord makes things easier in case you have the outlet far. It is also a pretty sophisticated-looking blender. You can choose from three colors: contour silver, liquid graphite, and onyx black. A one-year warranty from KitchenAid backs this product. If you are looking for something extraordinary than a regular hand blender, the OXA Smart Powerful Hand Blender Set should be your choice. 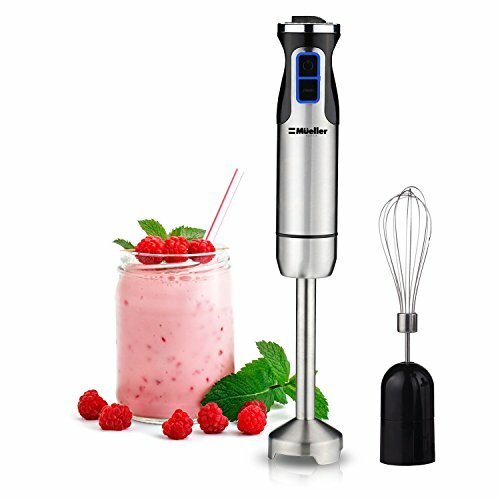 This hand blender comes with a whisk attachment, a 600-ml beaker, and a splash guard. In addition to these, there is also a 500-ml food processor. All the parts make up a highly efficient yet affordable hand blender set. There are four speeds in this blender and a turbo setting for those highly viscous concoctions. The motor is a 300W one that mixes the ingredients thoroughly, giving you just the right consistency. With this device, you can make salsa, pesto, and hummus. Everything except for the whisk and chopping bowl lid is dishwasher-safe. It should be pretty easy to clean them though. Also, it is quite lightweight at only 2.8 pounds and kind of sleek too. It does not take significant space in your kitchen. The bowls are BPA-free and made from high-quality plastic. The handle has a rubber grip that keeps the blender firm in your grip. It is best for both domestic and professional use. If you want to invest in the best hand blender that will last for years, any of the hand blenders above should do the job. The Mueller hand blender is quite easy to use given its detaching blade arm and motor arm. It blends efficiently too, whether you’re blending chunky peanut butter or just a smoothie. The KitchenAid and Onyx hand blenders both include multiple accessories. You can also chop stuff using these extra accessories. Both have high-quality construction too. Obviously, this makes their prices a bit higher. However, the results you get justify this price. The Onyx has the most speeds—six in total, and with a turbo speed as well. There are warranties for the first two products making them a safe purchase. If anything goes wrong, you can get a replacement from the manufacturer. One common thing is that all three comes from companies known for their durable and efficient kitchen appliances. You cannot really go wrong with such a perfect choice.